In the tradition of Bruce Chatwin, Colin Thubron, and Peter Matthiessen, The Last Unicorn chronicles deBuys's journey deep into one of the world's most remote places. 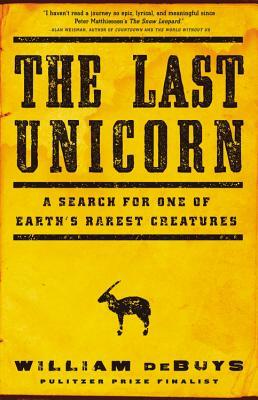 It's a story rich with the joys and sorrows of an expedition into undiscovered country, pursuing a species as rare and elusive as the fabled unicorn. As is true with the quest for the unicorn, in the end the expedition becomes a search for something more: the essence of wildness in nature, evidence that the soul of a place can endure, and the transformative power of natural beauty. William deBuys is the author of eight books, including River of Traps, a New York Times Notable Book of the Year and a Pulitzer Prize nonfiction finalist; Enchantment and Exploitation; The Walk (an excerpt of which won a Pushcart Prize in 2008); and A Great Aridness. An active conservationist, deBuys lives in New Mexico.